Applicability Statement 2 (AS2) is a standard originally created for transmitting EDI documents, but can be used for virtually any file type. The messages are built using the S/MIME format and sent over HTTP or HTTPS connections. 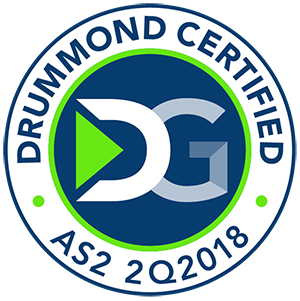 GoAnywhere MFT is Drummond Certified™ for AS2, which provides a high degree of assurance with security and compatibility to other AS2 solutions. The AS2 functionality in GoAnywhere MFT is Version 1.2 compliant and conforms with the RFC 4130 standard. AS2 messages can be compressed, signed, encrypted and sent over an SSL tunnel making AS2 a very secure option for transferring files. 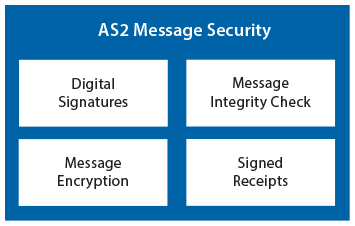 AS2 also implements MDNs (receipts) to ensure the delivery of the messages. Using signed receipts and comparing the returned message checksum value creates a non-repudiation of receipt (NRR), which is considered legal proof of delivery. File Attachments - GoAnywhere MFT is not limited to attaching just one file per AS2 message. You can attach multiple files to a message or use a variable to automatically attach files meeting your criteria. Compression - Zlib compression improves transmission time by shrinking the size of your messages. Digital Signatures - Ensure authenticity by digitally signing your messages. Most AS2 servers require signed incoming messages. Signed messages provide trading partners with confirmation of who sent the message. Message Encryption - Encrypt all the messages you send to a trading partner with their public key. Together with Digital Signatures and Message Integrity Checks, message encryption keeps your data safe. Message Integrity Check (MIC) - The MIC is a comparison of checksum values. A checksum is calculated when you send a message and your trading partner creates a checksum after they receive the message. The checksum is returned in the message receipt. If the values match, the message they received is the exact message you sent. Signed Receipts - GoAnywhere MFT receives automatic message receipts through synchronous connections. Manual receipts through asynchronous email and HTTP/S URLs are also available. Receipts can be digitally signed, completing the secure AS2 message cycle. Logging - Message logging in GoAnywhere MFT not only records standard AS2 "message traffic," but logs message date and time, who sent them, and what was sent. Configuring AS2 Resources (server connections) in GoAnywhere MFT saves time and provides additional security through separation of duties. A Resource Manager can configure an AS2 Resource for each trading partner. After a resource is defined, a Project Designer can create a task and just refer to the AS2 Resource without needing to know the confidential login credentials for a trading partner. In the AS2 Task example below, an EDI file is sent to the AS2 server and confirms its delivery through a receipt. Request a quote to integrate with AS2 using GoAnywhere MFT.